Donald Trump once infamously said he “could stand in the middle of 5th Avenue and shoot somebody” and “not lose any voters.” After his failed experiment to rip immigrant children away from their parents and lock them in cages, he now finds that his power has limits. Trump thought he could strong-arm Congress into building his wall by torturing immigrant children. It didn’t work. The majority of Americans saw the caging, drugging, and tormenting of children — some of them babies— as unspeakably horrific. Even Congressional Republicans rejected Trump’s baby jails. He quickly reversed his family separation policy, though it’s unclear when and how these families will be reunited. This was a very dark week in American history. But there was a bright spot: citizen activism. Trump’s baby jails shook America to its core. The American people actively rose up to reject this immoral policy. They marched. They flooded Congress with calls. They raised millions of dollars to help fund legal costs for immigrant families. Even people who normally don’t get involved in politics took the time to make their voices heard. Trump’s heinous acts awakened a powerful political force: Empathy. Because Trump and his advisors lack empathy, they didn’t see it coming. They failed to understand that the sight of crying children — and the sound of their anguished cries in a recording released by ProPublica — would unleash powerful waves of profound empathy. Empathy for the children. Empathy for the parents. And outrage at the soulless man who betrays and violates American values on a daily basis. Of course, Trump’s conservative supporters saw a completely different reality. They applauded Trump’s cruelty and blamed Democrats. Many Americans are wondering how anyone could support the harming of innocent children to make a political point, but the answer is simple: conservatives have a very different moral system than most Americans. And at its extreme base, this conservative “morality” justifies Trump’s cruel policy. As I’ve written before, the conservative moral system is based on the metaphorical idea of a Strict Father Family. In this metaphor, the strict father figure makes the rules and enforces them. It’s the job of everyone else to do as he says. If they don’t, it’s his job to punish them painfully enough so that they will do as he says in the future. Zero tolerance! Authority is justified. Winners deserve to win; losers deserve to lose. Winners are better than losers. This hierarchy is the key to understanding the conservative worldview, and thus conservative policy. Every conservative Republican policy flows from this hierarchy. First, these are immigrants. In the conservative hierarchy, non-Americans are below Americans. Therefore, they’re not entitled to American rights. Second, these immigrants are Latino. In the conservative hierarchy, whites are above non-whites and Western culture is above non-Western culture. Therefore, Latino immigrants have three strikes when it comes to the conservative mindset. Finally, adults above children. In the conservative worldview, children are not allowed to resist or disobey adults. Therefore, when immigrant children cry inconsolably or refuse to calm down, they are injected with psychotropic drugs to force them into compliance. All of this, together, fits into the conservative worldview because it’s seen as punishment for wrongdoing. They see Trump as the strict father handing out righteous punishment. Most Americans fundamentally reject this conservative “morality.” They see it as immorality and cruelty — and profoundly un-American. Faced with the full horror of extreme conservative policy, most Americans responded with deep empathy — and action — to force Trump to reverse himself. Yet this conservative “morality” is not just present in the immigration debate. We see it in healthcare, where the Republicans are constantly trying to strip people of coverage. We see it in taxes, where they are constantly trying to take from the working class and give to the rich. We see it in judicial selection, where they are constantly trying to stack courts to strip away reproductive choice for women and the rights of LGBT people. 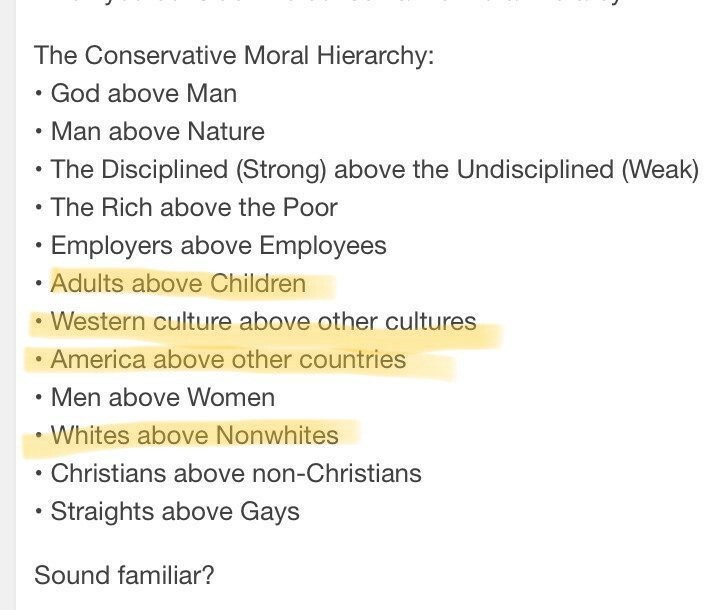 Whenever you find yourself asking “why” conservatives do the things they do, consult this hierarchy and you will find the answer. The key political question in America is whether their hierarchical morality — or our empathetic morality — will win the future. Judging by the past week, the answer is: Yes. Americans do care. A lot. The question is whether our care and activism can create a wave of moral momentum to take Congress back from Trump’s Republican Party in November 2018. George Lakoff, Professor Emeritus @UCBerkeley. Best-selling author of many books including "The ALL NEW Don't Think of an Elephant."